Hindu Weddings — Raining Roses Productions Inc. The beautiful & luxurious Hindu weddings that we have done the floral designs for. Anything that you envision, we can make a reality! One of my all-time favorite photographs. Not only is this traditional gown gorgeous, but her bouquet is beautiful as well. The bouquet compliments her dress and the groom's boutonniere perfectly. 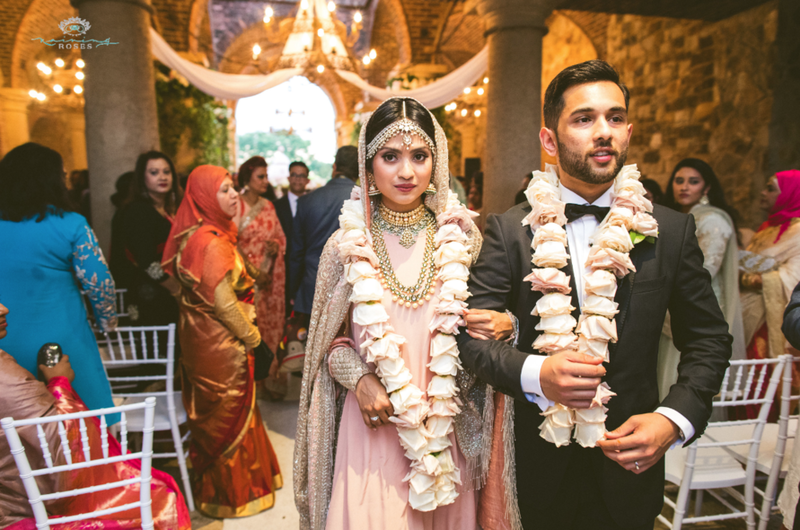 Bride and groom walk away as husband and wife in their traditional floral garlands, created by Raining Roses. A quick look at the details for the table decor. Raining Roses can do it all! A stunning photograph! look at those colors in her custom made garland and this gorgeous gown. The bride and groom surrounded by their loved ones... and the beautiful flowers of course! Floral designer and artist, Jesus Rodriguez, did an amazing job orchestrating the design, while keeping the tradition look in mind! Look at those details! Something we don't slack on at Raining Roses, perfecting the little things. We strive for an amazing finish that not only you will love but the guests as well. Thank you for viewing. Be on the look out for more blogs coming soon!